Why Investors Shouldn't Rely on Capital Gains - Richard C. Young & Co., Ltd.
One lesson reaffirmed to us from the dot-com bust is this: Prudent investors do not rely solely on capital appreciation for stock market gains. During the latter part of the 1990s many investors overloaded on technology and growth-oriented shares. When the collapse hit, they were not only left with a decimated portfolio, but one that produced little annual income. Without the benefit of decent dividends, investors were placed in a difficult position. Do they sell current positions at a loss and start over with a new strategy? Or wait it out and hope their shares would come back? Meanwhile, dividend-oriented investors at least had the comfort of knowing they would receive a meaningful check on a consistent basis. Receiving dividends makes it easier to be patient and wait for the next rebound. A continuous stream of dividends can be used for living expenses or can be reinvested at a lower share price, resulting in higher future dividend payments. As a result of the dot-com era, we stepped up our efforts to offer a higher-yielding stock portfolio. Prior to 2003, we managed stock portfolios comprised of companies entirely from the Dow Jones Industrial Index. While the yield on the Dow was higher than the yield of the S&P 500 and the NASDAQ, the Dow’s yield was still lower than we desired. In the spring of 2003, we launched a managed portfolio called the Retirement Compounders (RCs). The RCs is a globally diversified portfolio of 32 dividend-paying securities. Securities in the portfolio still include bellwether stocks from the Dow but also include other names we believe to be solid, blue-chip-type companies. With a yield today of 4.7%, the RCs pumps out a lot more cash than the Dow, the S&P 500 and, of course, the NASDAQ. Investing in the RCs still allows for the potential of capital appreciation. But during down or flat markets the RCs generate a predictable stream of cash that is especially important for retired and soon-to-be-retired investors. At Richard C. Young & Co., Ltd., we have been bracing for what we expect to be a difficult period ahead. The slowing global economic momentum that hit Europe, Asia, and much of the rest of the world earlier in the year is now washing up on U.S. shores. The rate of growth in the leading economic indicators has fallen to its lowest level since the recovery began. 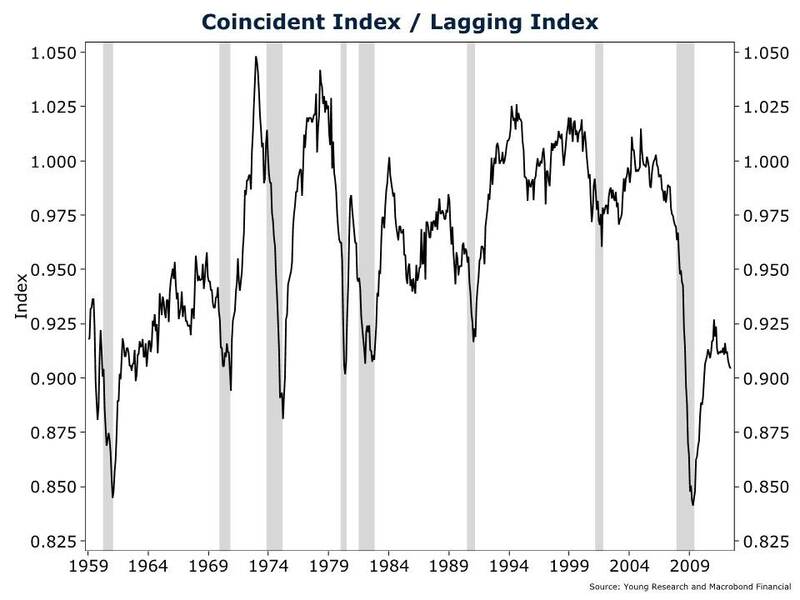 And the ratio of coincident-to-lagging indicators, often a better leading indicator than the leading index itself, looks perilous. Job growth has also slowed markedly in recent months. In the first quarter, the U.S. was adding an average of 225,000 jobs per month; but in the second quarter, payroll growth slowed to an average of 75,000. Slower payroll growth may be partly explained by give-back from an unusually warm winter; but initial claims for unemployment and survey data on the labor market are also worsening. 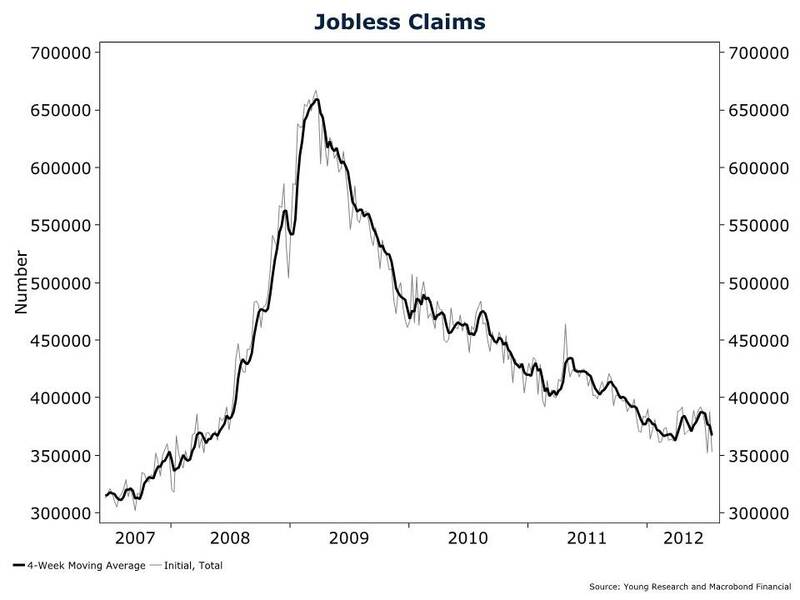 After bottoming out in March, jobless claims have trended upward. Copper and aluminum prices aren’t sending a bullish signal. Copper is known to have a PhD in economics for its ability to forecast economic growth. 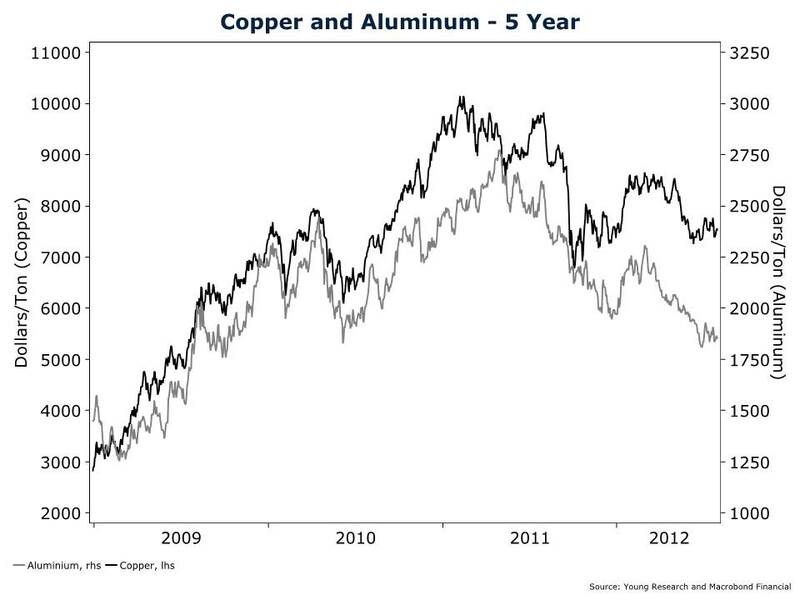 My chart shows copper prices rolling over and aluminum prices crashing through a nearly three-year low. Consumers’ fundamentals also look shaky. Over the last two years, consumers have dipped into savings to help sustain spending. The savings rate has plunged from 5.8% in June 2010 to a bubble-era 3.4% recently (the long-term average is about 7%). When you consider that the entirety of first-quarter GDP growth can be attributed to consumer spending, a plunging savings rate becomes all the more concerning. What happens if weakening economic momentum and a softening jobs picture cause consumers to close their wallets? The icing on the cake is small business sentiment. Small businesses are the lifeblood of the U.S. economy—creating over two-thirds of all new jobs. The NFIB Small Business Optimism Index plunged three points in June—its biggest drop in over two years. Nine out of the ten components in the index worsened last month. The only component that improved was credit conditions—no surprise given record-low interest rates. But easy money doesn’t do much to stimulate the economy when businesses aren’t interested in expanding. 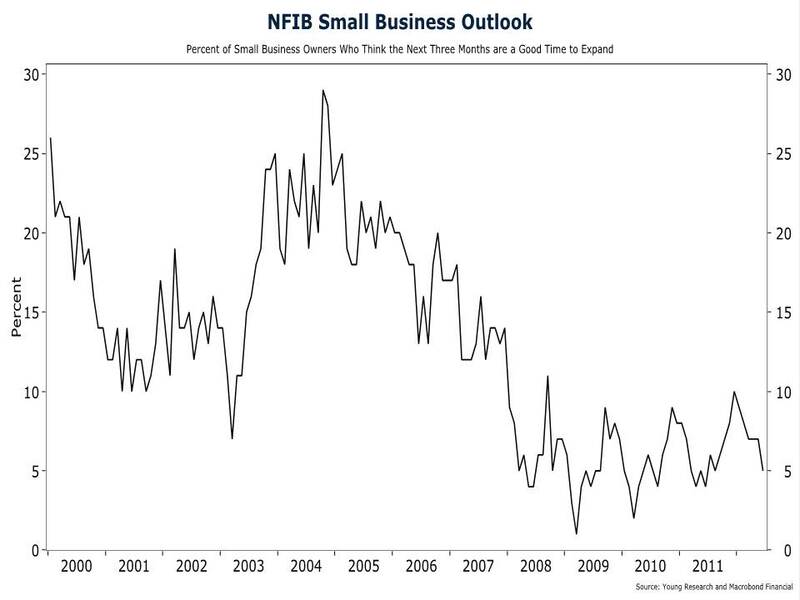 According to the NFIB small business survey, only 5% of businesses think now is a good time to expand—a level historically associated with recession. America’s job creators cite a weak economy and hostile political climate as the primary reasons not to expand. Small businesses’ view of the political climate is especially troubling for the economy. The June NFIB survey numbers don’t include the effects of the Obamacare ruling. Since the NFIB was the lead plaintiff in the case, it is safe to assume that small business owners were disappointed with the decision. Obamacare will add unknown burdens to the small business community. The law includes 20 new taxes and mountains of regulations that haven’t even been written. In our view, without America’s small businesses on board, a bona fide expansion in the broader U.S. economy is likely to remain elusive. Oddly, the slowing economic momentum hasn’t fazed the U.S. stock market much. Despite some choppiness over the last couple of months, the S&P 500 is still up more than 8% YTD and only a few percentage points below its early April high. Why the disconnect between economic momentum and stock market performance? We would point you to the Federal Reserve. Expectations that monetary authorities would act to support the markets at the first sign of economic weakness have helped prop up stock prices. Chairman Bernanke promised investors as far back as last fall that the Fed would come to their rescue as needed. And at the Fed’s June meeting, he delivered on that promise. The Fed announced it would extend Operation Twist (selling short-term Treasuries and buying long-term Treasuries) by $267 billion over six months. In the press conference following the meeting, Mr. Bernanke also strongly hinted that another round of money printing may be forthcoming. We have long been critical of the Fed’s unconventional monetary policies—not without good reason. The last five rounds of monetary stimulus appear to have provided no enduring benefit to the U.S. economy. We’ve had QE1 and QE2 and Operation Twist 1 and 2, zero-percent interest rates, and the promise of zero-percent interest rates well into the future. Yet, as I’ve already outlined, economic momentum continues to slow. In our view, the Fed’s unconventional and untested policies have become more harmful than helpful. The Fed is punishing savers with perpetually low interest rates, promoting a dangerous misallocation of capital, creating an unhealthy dependence on zero-percent interest rates, complicating the eventual exit policy, and laying the groundwork for a future government-debt crisis by financing profligate government spending. All in the name of what—higher stock prices? The only tangible result of the Fed’s unconventional policy has been to temporarily boost equity prices. If the Fed moves forward with QE3, we anticipate a similar outcome: No enduring benefit to the real economy and a speculative rally in the stock market. Although high-quality stocks (which we define as dividend-payers with high barriers to entry or durable competitive advantages) tend to lag during speculative rallies, we believe they offer long-term investors more favorable prospects. You won’t find us chasing performance in stocks like Netflix or Facebook to profit from a speculative rally. Both companies operate in industries with almost no barriers to entry. Take Netflix by example. The company owns none of the content it sells, nor does it own the transmission lines required to deliver its content. It is a virtual movie store. Anybody with enough capital and motivation can easily replicate the business. And ventures such as Hulu, HBO GO, and Xfinity, among others, have done just that—and they are taking market share. We much prefer businesses with durable competitive advantages. Companies such as AT&T and Nestlé. AT&T traces its roots back to 1876 when Alexander Graham Bell and his partners Gardiner Hubbard and Thomas Sanders succeeded in earning patents for Bell’s telephone inventions. Soon the company opened its first telephone exchange in New Haven, CT, and rapidly expanded through major cities across the country. The company had a monopoly on telephone technology until 1894 and used it wisely, growing its footprint across the U.S. Today AT&T owns one of the world’s most powerful and advanced global backbone networks for communications, capable of carrying 28.9 petabytes of data with 99.999% reliability. AT&T also owns the nation’s fastest 4G mobile broadband network and manages a wi-fi network with access to 190,000 hotspots worldwide. AT&T’s network also includes 916,000 miles of fiber worldwide, 43.6 million access lines, 16.5 million broadband connections, and MPLS services that reach 182 countries. It would be nearly impossible to recreate AT&T’s network from scratch today. Pharmacist Henri Nestlé made the first step toward what would become the world’s largest food company in 1867. Nestlé created a baby food using a mixture of milk, wheat flour, and sugar to save a neighbor’s dying child. Today Nestlé owns a world-class stable of brands, including household names Nescafe, Carnation, Stouffer’s, Gerber, Kit Kat, and Purina. Nestlé has a generations-old presence in most countries in the world, having expanded rapidly through its history. Long-term relationships with its local markets are vital to Nestlé’s competitive advantage. The strength of its brands and a massive distribution chain protect Nestlé from competing forces. The most pressing investment issue for millions of Americans is how to generate income from their portfolio. With the global economy in crisis, stock market appreciation seems anything but a sure thing. And income standbys, such as Treasury bonds, municipal bonds, and CDs offer depressingly low yields. To help combat an environment of uncertainty and low yields, we believe investors can benefit from a diversified portfolio that includes higher-yielding, higher-quality stocks. AT&T and Nestlé are two we believe fit this category. For fixed income, we favor an emphasis on short-term corporate bonds. Yes, the yields are historically low; but shorter-term bonds will fluctuate little when rates rise and will help reduce portfolio volatility if we have another stock market crash. P.S. In an environment of low returns from stocks and low yields from bonds, investors need to pay close attention to annual expenses. InvestmentNews recently reported on two classes of mutual fund shares from American Funds. The A shares of American Funds’ EuroPacific Growth fund has an 84-basis-point expense ratio and a maximum load fee of 5.75%. The F-2 shares of the fund have an expense ratio of just 58 basis points. According to InvestmentNews, an investment in the A shares, with the maximum front-end fee, would have a three-year annualized return of 2.79%. The same investment in the F-2 shares would have a return of just over 5%. At Richard C. Young & Co., Ltd., we have shifted most of our fund investing to exchange-traded funds, which have much lower expense ratios than most traditional mutual funds.